Baths of Distinction of St. Petersburg has won “Best Of Customer Service” on Houzz®, the leading platform for home remodeling and design. The 15-year old bathtub manufacturer and retailer was chosen by the more than 40 million monthly unique users that comprise the Houzz community from among more than one million active home building, remodeling and design industry professionals. Bill Hamilton, CEO of Baths of Distinction says his dedicated service staff work extremely diligently with clients to ensure total customer satisfaction; the old adage, ‘the customer is always right’ is how we think. "The Houzz community selected a phenomenal group of Best of Houzz 2018 award winners, so this year's recipients should be very proud,” said Liza Hausman, Vice President of Industry Marketing at Houzz. "Best of Houzz winners represent some of the most talented and customer-focused professionals in our industry, and we are extremely pleased to give them both this recognition and a platform on which to showcase their expertise." Baths of Distinction is a leading designer, manufacturer and online retailer of exclusive high quality acrylic bathtubs. 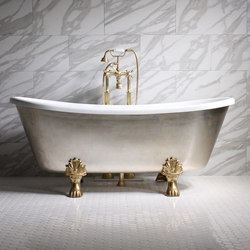 These tubs range from vintage style clawfoot tubs to extremely contemporary zen style tubs. They also produce some of the highest regarded air jetted, water jetted and full hydrotherapy bathtubs in the industry. Baths of Distinction ships throughout North America. Houzz is an excellent platform for home remodeling and design, providing people with everything they need to improve their homes from start to finish – online or from a mobile device. From decorating a small room to building a custom home and everything in between, Houzz connects millions of homeowners, home design enthusiasts and home improvement professionals across the country and around the world. With the largest residential design database in the world and a vibrant community empowered by technology, Houzz is the easiest way for people to find inspiration, get advice, buy products and hire the professionals they need to help turn their ideas into reality. Headquartered in Palo Alto, CA, Houzz also has international offices in London, Berlin, Sydney, Moscow, Tel Aviv and Tokyo. Houzz and the Houzz logo are registered trademarks of Houzz Inc. worldwide.